“Minimalist” Running is running only with your running shorts or running without a shirt/singlet. 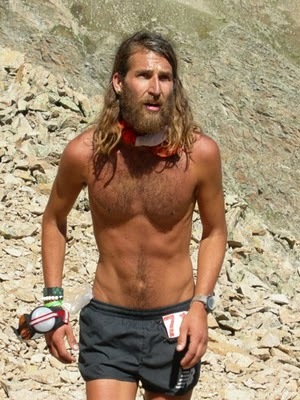 Except for the long hair and the beard of “minimalist” ultratrail runner Anton Krupicka (www.antonkrupicka.blogspot.com), I tried to run at the ULTRA Oval Track yesterday morning “half-naked”, wearing only my running shorts and shoes! Well, after finally completing eightt (8) laps, the lady Security Guard came down at the oval track and cautioned me that it is prohibited to run “half-naked” at the ULTRA Oval Track. Being a “good soldier”, I immediately picked-up my singlet on the sideline and wore it. And continued my run for anothe 5 laps. I did not bother to argue with the Lady Security Guard asking her as to where her source of authority came from as I don’t see any written rules and regulations in the use of the oval track displayed around. However, I suspect that the “seniors” (men & ladies) walking around the oval track made some complaints with the Lady Security Guard. This is the same experience I had when I ran counterflow with the rest of the runners where a “beginner/newbie” runner complained to the Security Guard that I was running the opposite way. Is there any rule or regulation or provision from the etiquette of running that it is prohibited to run “half-naked” in road, oval track, and trail runs? I think in all track and field competitions in the oval track, all the athletes should be wearing a singlet or shirt where they could pin their race bibs/numbers in order to identify them during the competition. However, in road and trail runs, I don’t see any provision from the race organizer’s rules and regulations that it is prohibited to run without any singlet or shirt. Most of the ultratrail runners pin their race numbers on their running shorts. I saw some runners in our local races running on barefoot but nobody is prohibiting them from running. But running without a shirt is something that should be “tested”, most especially running in a country like ours which is hot and humid. I may not be as young, tall, handsome and fast like Anton Krupicka or have a nice body physique like Derek Ramsey, but we will see if I can run as the “Bald Runner” and at the same time the “Bold Runner” during the Century Tuna Half-Marathon. I don’t see it wrong running without your singlet or running barefoot. But its completely wrong running without your shorts (Joke). heheheh… that would be I think d first in local races sir… hope they will let u run half naked, as there ads on the century superbods run , derek was running half naked too… hope gurls wont be confused , they might chase you all d way to 21 klms.. hehehheh.. show us some piks on the run pls. Foreigners running here in our country love to run half naked simply because they like to tan or they enjoy the benefit of early sunshine. However, too much exposure to ultra violet rays particularly between 10am up to 4pm maybe hazardous to our skin specially if you are fair or white skinned. The “Bold Runner”. Haha, nice one! You could start something new here, perhaps a fad. See you sir tomorrow. Cheers! I received the package (DVD) you sent through LBC this afternoon. Thanks a lot. I immediately watched “Running the Sahara” Very, very inspiring. go for it, if they stop you and not derek then there is something wrong with the mindset of the organizer or the society for that matter. Why in UP diliman they allowed the neophytes run naked around the “UP ikot” stark naked? we do it all the time in the US where I’ve run most of my races. good luck to you BR, if you pass muster and nobody says anything against your running half naked, I will run in may (TBR dream marathon) without my shirt. In my other sport, the idea behind the minimalist movement is trading comfort to shed pack weight. I weighed my NB singlet and found out it’s just 100 grams. Since doing minimalist running. Don’t forget to use minimalist shoes also. If you’re not familiar what I’m talking about, you can check a sample by clicking on the link below to see how it looks like.